The Concilium Plebis (English: Plebeian Council or Plebeian Assembly) was the principal assembly of the ancient Roman Republic. It functioned as a legislative assembly, through which the plebeians (commoners) could pass laws, elect magistrates, and try judicial cases. The Plebeian Council was originally organized on the basis of the Curia. Thus, it was originally a "Plebeian Curiate Assembly". The Plebeian Council usually met in the well of the comitium and could only be convoked by the Tribune of the Plebs. The assembly elected the Tribunes of the Plebs and the plebeian aediles, and only the plebeians were allowed to vote. When the Roman Republic was founded in 509 BC, the Roman people were divided into a total of thirty curiae. The curiae were organized on the basis of the family, and thus the ethnic structure of early Rome. Each curia even had its own festivals, gods, and religious rites. The thirty curiae gathered into a legislative assembly known as the Comitia Curiata or Curiate Assembly. This assembly was created shortly after the legendary founding of the city in 753 BC, and it formally elected new Roman kings. During this time, plebeians had no political rights. Each plebeian family was dependent on a particular patrician family. Thus, each plebeian family belonged to the same curia as did its patrician patron. While the plebeians each belonged to a particular curia, only patricians could actually vote in the Curiate Assembly. Before the first plebeian secession in 494 BC, the plebeians probably met in their own assembly on the basis of the curiae. However, this assembly probably had no political role until the offices of plebeian tribune and plebeian aedile were created that year, in order to end the secession. As a result of the plebeian movement, the patrician aristocracy formally recognized the political power of the plebeian tribune, and thus legitimized the power of the assembly over which the plebeian tribune presided. This "Plebeian Curiate Assembly" was the original Plebeian Council. After 494 BC, a plebeian tribune always presided over the Plebeian Curiate Assembly. This assembly elected the plebeian tribunes and the plebeian aediles, and passed legislation (plebiscita) that applied only to the plebeians. During the later years of the Roman Kingdom, King Servius Tullius enacted a series of constitutional reforms. One of these reforms resulted in the creation of a new organizational unit, the tribe, to assist in the reorganization of the army. Its divisions were not ethnic (as the divisions of the Curia were), but rather geographical. Tullius divided the city into four geographical districts, each encompassing a single tribe. Between the reign of Tullius and the late 3rd century BC, the number of tribes expanded from 4 to 35. By 471 BC, the plebeians decided that organization by tribe granted them a level of political independence from their patrician patrons that the curiae did not. Therefore, around 471 BC, a law was passed to allow the plebeians to begin organizing by tribe. Thus, the "Plebeian Curiate Assembly" began to use tribes, rather than curiae, as its basis for organization. As such, the Plebeian Council changed from a "Plebeian Curiate Assembly" to a "Plebeian Tribal Assembly". The only difference between the Plebeian Council after 471 BC and the ordinary Tribal Assembly (which also organized on the basis of the tribes) was that the tribes of the Plebeian Council included only plebeians, whereas the tribes of the Tribal Assembly included both plebeians and patricians. However, most Romans were plebeians. Therefore, the principal differences between the Plebeian Council and the Tribal Assembly were mostly legal rather than demographic. These legal differences derived from the fact that Roman law did not recognize an assembly consisting only of one group of people (plebeians in this case) from an assembly consisting of all of the People of Rome. Over time, however, these legal differences were mitigated with legislation. The Plebeian Council elected two plebeian officers, the tribunes and the aediles, and thus Roman law classified these two officers as the elected representatives of the plebeians. As such, they acted as the presiding officers of this assembly. 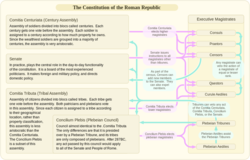 Chart showing the checks and balances of the Constitution of the Roman Republic. The creation of the office of plebeian tribune and plebeian aedile marked the end of the first phase of the struggle between the plebeians and the patricians (the Conflict of the Orders). The next major development in this conflict occurred through the Plebeian Council. During a modification of the original Valerian law in 449 BC, plebiscites acquired the full force of law, and thus applied to all Romans. Before this time, plebiscites had applied only to plebeians. By the early 4th century BC, the plebeians, who still lacked any real political power, had become exhausted and bitter. In 339 BC they facilitated the passage of a law (the lex Publilia), which brought the Conflict of the Orders closer to a conclusion. Before this time, a bill passed by any assembly could become law only after the patrician senators gave their approval, which came in the form of a decree called the auctoritas patrum ("authority of the fathers" or "authority of the patrician senators"). The lex Publilia required the auctoritas patrum to be passed before a law could be voted on by one of the assemblies, rather than afterward. This modification seems to have made the auctoritas patrum irrelevant. Thus, the Plebeian Council became independent of the patrician aristocracy in everything but name. By 287 BC, the economic condition of the average plebeian had deteriorated further. The problem appears to have centered on widespread indebtedness. The plebeians demanded relief, but the senators, most of whom belonged to the creditor class, refused to abide by the plebeians' demands. The plebeians withdrew en masse to the Janiculum hill, resulting in the final plebeian secession. To end this movement, a plebeian dictator (Quintus Hortensius) was appointed, who ultimately passed a law called the "Hortensian Law" (lex Hortensia). The most significant component of this law was its termination of the requirement that auctoritas patrum be obtained before any bill could be considered by the Plebeian Council. In this way the law removed from the patrician senators their final check over the Plebeian Council. The lex Hortensia, however, should not be viewed as the final triumph of democracy over aristocracy. Close relations between the plebeian tribunes and the senate meant that the senate could still exercise a great degree of control over the Plebeian Council. Thus, the ultimate significance of this law was that it robbed the patricians of their final weapon over the plebeians. This ended the Conflict of the Orders, and brought the plebeians to a level of full political equality with the patricians. Although the Plebeian Council survived the fall of the Roman Republic, it quickly lost its legislative, judicial and electoral powers to the senate. By virtue of their status as perpetual tribunes, both Julius Caesar and the Emperor Augustus always had absolute control over the Plebeian Council. The Plebeian Council disappeared shortly after the reign of Tiberius. Polybius (1823). The General History of Polybius: Translated from the Greek. By James Hampton. Oxford: Printed by W. Baxter. Fifth Edition, Vol. 2.